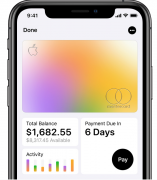 Apple has announced its first consumer credit card, entering the space of financial services in partnership with Goldman Sachs. As FinTech Futures reported in February, the partnership had already leaked and there were rumours the card was coming. Goldman Sachs had started building customer support call centres and an internal system to handle payments, a project that could cost the bank $200 million. The card, which is expected to come out this summer and soon launch its pilot programme, will let consumers apply digitally and have their card issued “straight to their phone”. Consumers will be able to make purchases even more easily, straight from their digital device (smartphone, wearable, etc.) – just like with Apple Pay. The physical card, available on demand, will not have a card number or CVC, making it completely safe and secure. “Using revolutionary security features like TouchID or FaceID, it takes seconds to authenticate and is ready for the cardholder to tap, swipe and check out,” says Craig Vosburg, president, North America, Mastercard. Vosburg also says that the Apple card includes token services and M Chip technologies that help store the card on a digital device without exposing important details and while enabling fast contactless payments. Mastercard says it is integrating technology to allow for digital wallet payments in transit systems around the US including Los Angeles, Boston,and Denver. New transit solutions are expected to be live in more than 20 markets in the United States, including New York City, within the next few years. According to a recent study cited by Vosburg, 68% of those who have loaded a debit or credit card to a mobile wallet indicated they expect to make 50% or more of their in-store purchases using a digital wallet within two years. Mastercard brought token services to Apple Pay in 2014 and late last year announced its strategy to enable token services on all cards by 2020.